Essential Fruits, Inc., based in Narra, Palawan, manufactures HG Guyabano Tea Leaf Drink, made of steeped dried guyabano leaves, water, and natural sugar cane syrup in 500ml bottle, and soon in 250 ml. The guyabano leaf, when processed into tea, has a natural sweetness and incorporates all the health benefits found in the fruit—and more. It has been known to calm the nerves and boost one’s energy. The taste is both unique and refreshing. It does not contain caffeine. 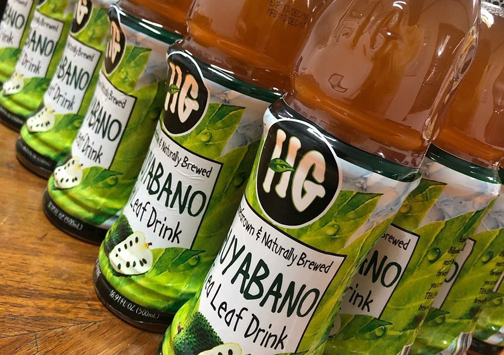 HG Guyabano Tea Leaf Drink is available at S&R, South Supermarket, SM Kultura, Bo’s Coffee, Landers, Rustan’s department stores, at selected airport stores in NAIA, Cebu, and Palawan, and online at orich.com.ph or tropicalshop.com.ph.